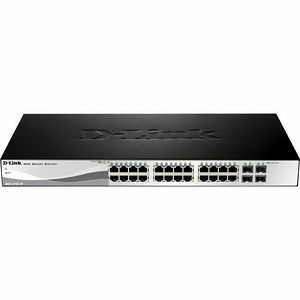 The D-Link DGS-1210 Series is the latest generation of Web Smart switches to feature D-Link Green technology. Equipped with 10, 16, 24, or 48 10/100/1000Mbps ports and two or four combo 10/100/1000BASE-T/SFP ports, the series integrates advanced management and security functions that provide performance and scalability. Additionally, the 10/100/1000Mbps ports on the DGS-1210-10P are PoE enabled, offering ease-of-use and green features such as PoE scheduling, which allows for the power to be shut off at a pre-determined time. Management options for the DGS-1210 Series switches include SNMP, Web Management, SmartConsole Utility, and Compact Command Lines. The series also supports ACL filtering and the D-Link Safeguard Engine. The DGS-1210 Series uses Auto Voice VLAN, ensuring higher priority for voice traffic. The DGS-1210-10P comes with a fanless design in a compact 13-inch desktop enclosure; the DGS-1210-16 and DGS-1210-24 come in a fanless design with a 19-inch metal case. The DGS-1210-48 is equipped with two smart fans; these fans are set to low speed by default and will automatically switch to high speed once the temperature threshold has been reached. A fanless design allows for quieter operation and guarantees an extended lifetime, while smart fans help to considerably save power.